The above paragraph is the rationale given in ISO 16890 for the two distribution curves used in the standard to classify “urban” and “rural” filters. The Standard goes on to give a detailed explanation of the methods used to classify “urban” and “rural” filters. There are two major problems with this paragraph. First, it is not defined correctly to analyze filters used in buildings in the United States. It covers only “outside air.” Particles generated from indoor sources represent a substantial portion of the particles that are filtered from the air. The Standard should not be based solely on outside particles that may or may not reach the filters in HVAC systems. To be accurate “ambient air” should be defined as the air from the filter environment representing the total of all inside generated and outside generated particles. Secondly, the statement that “particle sizes in ambient air are bimodal distributed with a fine and coarse mode” is not correct. Particles in all environments are “multimodal” and vary in size from nanoparticles to particles over 10um. This is true whether they are measured in “urban” areas or “rural” areas. 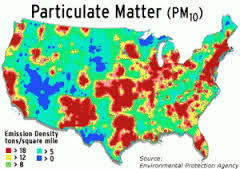 Likewise the statements that fine filters designed to remove PM1 and PM2.5 particles should be evaluated using a size distribution which represents urban areas and coarse filters designed to remove PM10 should be evaluated using size distributions of rural areas are equally incorrect. This use of “urban” and “rural” particle distributions is not logical. It is somehow based on the premise that rural areas should be primarily concerned with the removal of PM10 while urban areas should focus on the removal of PM1 and PM2.5. Rural environments generally have a particle distribution skewed toward larger particles. The reason for this is that there aren’t as many cars, trucks, industries, and people to create the fine and ultrafine particles. However, for the purpose of filter classification this distribution is meaningless. The fact is urban areas have higher particle levels at PM1, PM2.5 and PM10. This map illustrates this fact. The highest PM10 levels are in the high density urban areas. These are also the areas with the highest PM1 and PM2.5. Likewise, PM1 and PM2.5 can be of concern in rural areas. These particles stay in the air for an extended period of time. An unfavorable wind can bring high levels of urban pollution to many so called “rural” areas. More importantly, all buildings – whether they are in urban or rural areas – have the potential to have high sub-micron particle counts. A good example is a grocery store with an internal kitchen and bakery. Cooking and baking has been shown to produce high sub-micron particle counts in retail stores. There are a whole host of other human activities that can produce high levels of PM1 and PM2.5 indoors. The fact is this classification system is not based on sound data. It raises the question: Have these statements regarding PM1, PM2.5 and PM10 in ISO 16890 been reviewed by environmental and indoor air scientists? I would be very surprised if they have and even more surprised if they would pass a peer review process. They do not have a place in an international air filter test standard.